Well, we finally made it to Costa Rica. We motored around Punta Burica yesterday morning. Again, very light conditions. The swell was monstrous (to us). I can't imagine what it's like when the wind is blowing hard! It is too far to make it all the way into Golfito from our anchorage at Punta Balsa. We were thinking of stopping at Pavones, where there's supposedly an anchorage that's not too bad. But after our sloppy rolly anchorage off Punta Balsa the previous night, we wanted something calm. So after taking a look at Pavones (famous for surf), we decided to go on to Puerto Jiminez across the Golfo Dulce from Golfito. We are glad we did. Easy anchoring spot (thanks to waypoints from others) and a nice quiet non-rolly anchorage. We also had a nice hour and a half sail on our way up the Golfo Dulce. The afternoon winds picked up to about 12 knots right on our beam, so we were able to shut down the engine and still make 6 knots. We will come back and explore Puerto Jiminez, the Osa Peninsula, and Corcovado National Park later. Today we head for Golfito and get checked in to the country. We left the Secas at about 10am. The wind as usual was about 2 knots from the SW, so we motored most of the 20 miles. Toward noon an onshore breeze developed and we were mostly sailing for a little while. The guidebook mentioned that cruisers favored the Punta Jurel anchorage at Isla Parida. There is a small resort there that welcomed cruisers. So that is where we planned to stop. But on our way in, we passed close to Isla Gamez, and that looked just beautiful. We went on in to Punta Jurel, and put the anchor down for lunch (we were starving by then). Either the resort is no longer functioning, or it is in sleep mode for rainy season. The beach looked junky (buckets and things scattered about) and not like it was being maintained as a resort. We could see one building in the trees with a guy sitting on the porch, but no other signs of life. The anchorage itself was OK, but nothing special. So after a quick crew conference, we voted unanimously to go back out and anchor off Isla Gamez (only about a mile away). This turned out to be a beautiful anchorage--the best so far on the Pacific side of Panama, in our opinion. Nice holding in heavy sand, a gorgeous beach with palm trees ashore, some wind to keep us cool, and very little swell. I could have stayed here for a week or more. There were a couple of local boats picnicing at the beach on Sunday when we arrived, but they were gone by sundown. We had the whole place to ourselves all day Monday. We swam into the beach and found some coconuts. We burned our trash at low tide on the beach. There is supposed to be good snorkeling here, but again rainy season has rendered the water very cloudy, with only about 8 foot visibility. So we didn't even bother. We got the usual evening heavy rain, with a little wind. But we were sheltered and secure. A very nice anchorage (this time of year). We left our spot in the Contreras early in the morning, and motored in mostly calm winds to the Secas. anchorages too shallow and too confining. In each bay, we saw one mooring in the exact best spot to anchor. Just inshore of the mooring is where the bottom came up fast. So pick a spot just outside of the mooring. The northern anchorage, where we ended up, is off a pretty little sand beach with palm trees. We anchored near a rocky pile (we could see it on the depth sounder and just barely make it out from deck). Dave managed to pick out a nice sand spot in 20' of water. The anchorage was passable in the mild conditions we are experiencing... a little rolly, but not too bad. In the morning I snorkeled the whole area, and did find some live coral and tropical fish just inshore of us, but the water was disappointingly murky. Friends passing thru here a few years ago mentioned snorkeling and finding clear water here even during rainy season. But not for us this time. We also did a little gunkholing in the dinghy. The resort here looks deserted. We met one caretaker fishing off the floating dock in the southernmost bay. He said the resort is closed until December 15. We spent all Saturday here, and expected to be inundated with weekenders by Saturday afternoon. We did see 2-3 small sport fishing boats trolling around the island, and 2 of them anchored overnight, but away from us. They were gone at first light. The jump from Isla Gamez to Golfito is about a hundred miles... too far to make in one day. Friends had told us of a passable overnight anchorage at Punta Balsa, on the east side of the Burica Peninsula, on the very western edge of Panama. It's 35 miles from Isla Gamez to Punta Balsa, so we left in the early morning, motoring north around Isla Parida. Again, virtually no wind. In heavier conditions, the way north and west around Parida might be risky due to relatively shallow water (15' deep). Some of these areas would break in heavy seas. Even though we've had less than 10 knots for nearly a week now, there is still a 6-8' long Pacific swell. We have not been 'off soundings' in so long that Dave thought our depth sounder wasn't working. But the area between the islands in the Bay of Chiriqui (where we've been for the last week) and the Burica Peninsula gets very deep--1500 feet deep. We were only about a mile off the waypoint we'd been given before we finally 'found the bottom' at 500 feet. It still didn't look like we'd find any protection from the considerable swell rolling in. But we kept on going in. for quite a ways out from shore. During the night the conditions changed from 'really rolly' to 'not bad', as the current and wind changed. The current runs along the shore and reverses with the tide. For about 6 hours during the night, with no wind, the current held us beam to the swell, and we rolled like heck. But the wind was zero and we knew we were stuck well to the bottom, so it wasn't dangerous, just uncomfortable. We have only seen one other cruising boat during this whole trip, and only a couple fishing boats. We are in the 'skip zone' for the Panama Pacific net, so we can't hear the friends we just left in Panama. We are looking forward to getting in to Golfito, where there is a fully protected anchorage, and reportedly a small cruising community. For the last 2 days, it has been pouring rain. On our last night in Bahia Honda, the heavens just opened up, and it poured all night long. The first hour of pouring rain is nice... it fills the water tank, washes the salt off the boat, etc. The next day, we left Bahia Honda in the rain, and sailed in the rain, and then it poured all night long again. Yesterday, it only threatened most of the day, but everywhere we looked were low black clouds. After 3 days of it, we are shouting ENOUGH!!! Taking a close look at the weather map (http://weather.noaa.gov/pub/fax/PYEB11.TIF), I see that the Inter Tropical Convergence Zone has been sitting right over top of us again. Hopefully it will move a little south or a little north and leave us alone. I see a gleam of sunshine in the Eastern sky this morning. The low black clouds that have surrounded us for the past 3 days have broken up some. Hopefully we'll get a sunny day today. (and by 11am, we'll probably be complaining about how hot it is! :) But we sure need a day of dry weather to chase the damp away. We totally skipped Isla Coiba, which is no longer a penal colony and is now a national park. Until recently, there was a reasonable fee to stay for a day or two (something on the order of $10-$20 per night). But cruisers who arrived in Panama City just before we left said that they were asked for $100/day to stay there. ($20 pp per night, and $60 for the boat for the first night, and $40 for subsequent nights). We wanted to go check it out for ourselves, to see if it really was that outrageous. But we're getting short on time and we just decided we'd skip it. I wanted to go, confirm the fee, and leave immediately (in protest) to make a point. But it seemed a little ridiculous to go to that extent (it's 2 hours motoring to get there, and 2 hours to get anywhere else). So we went directly from Bahia Honda to the Contreras, going around the south and west end of Isla Medidor. (Someone had warned us not to go through the narrow slot between Medidor and the mainland, saying the currents and waves were nuts there). We found a nice anchorage in the deep bay on the north side of Isla Brincanco, approximately where the Bauhaus guide indicates. The sketch chart, when used with the GPS and Sea Clear to plot the boat on the chart, isn't exactly accurate. But it is accurate from a visual standpoint. The best anchorage IS west of the prominent rocks, but the location that that plots in Sea Clear on the sketch chart is just EAST of the rocks. We didn't get to do any exploring, because it started raining soon after we dropped anchor, and poured all night long. There were 2 fishing boats that came in late in the day and anchored in the NW corner of the bay. They were gone at dawn. and then heavy vegetation everywhere else. The comments we heard about this bay seemed unanimously wonderful. The West Coasties all said "Better even than Bahia Santa Elena in Costa Rica." Since we haven't been to Bahia Santa Elena yet, we couldn't relate. However, our own reaction is WOW! After nearly 2 weeks of rockin and rollin at the Flamenco anchorage in Balboa, and then 4 days of tenuous rolly anchorages, this is REALLY NICE. Bahia Honda is a really deep bay where you can get total protection from the swell and the wind. And amazingly, it is very sparsely developed and so our anchorage feels very remote. We heard a waterfall ashore after the rain last night, and howler monkeys and various birds, too. We are the only cruising boat here. We've only seen one other boat in the last 5 days of traveling, and they were headed the other way. From listening to the SSB nets, it seems nobody moves anywhere in the Panama/Costa Rica area this time of year. We left Isla Cebaco about 10am yesterday, and headed NNW toward the coast. We wanted to sightsee the coast a little on our way to Bahia Honda. It is a beautiful and wild coast. Not much in the way of habitations evident here. Our Panama road map doesn't show any roads in this area. And there is no cell phone service at all. We did check out Puerto Escondido, the next bay to the SE of here. Tao 8 told us it was a very nice anchorage. It did look nice, but we are glad we carried on to Bahia Honda. Puerto Escondido is a typical semi-exposed swelly anchorage compared to here. Soon after we dropped anchor, we were visited by Domingo, a talkative old guy in a cayuca. We had heard about Domingo from other cruisers... He and his family live across the bay on a finca (farm) and he can supply some fresh veggies, and also can hustle gas, diesel, and 'dry goods' from the town. and see if there is something he could spare. I don't think we should just give stuff to anyone who asks. But it's hard to say no sometimes, when we have so much and they have so little. We had all 3 chart programs (SeaClear with the Bauhaus chartlets, Nobeltec with Raster charts, and MaxSea with older CMap charts) up and recording our trail as we came in. The Bauhaus chart is still the most accurate, except we found at least one shoal (5' or less at mid tide) where he has a 6 meter sounding. CMap and the Raster charts seem to agree with each other pretty well and are both off positionally by about .2 miles. Our raster chart says it is WGS72. In the Bauhaus Guide it is the '6' (meter) depth indication, due north of the eastern edge of Punta Miel and SSW of Isla Levin. (on our raster chart, which has depths in fathoms, it's where the 3 1/4 spot is). to the north of it, outside the blue shading, to go into the next bay. We were RIGHT OVER the 6 meter depth indicator when the depths went from 30' - 15' - 5' in one boat length. I am not sure we touched, but we backed right out of there, nosed out a little further and tried again, and got the same. So then we went way around the point. spot for a lancha to Isla Medidor, where we have heard there are some very large foreign residences under construction. 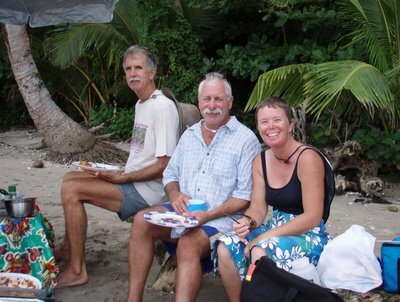 After 2 more long days of motor sailing westward, we are finally in the area known as 'Western Panama'. In the last blog post, we had just rounded Punta Mala. We actually turned the motor off and did some sailing that morning. However, soon after we finally shut the motor down, true to form, the wind went light and on our nose about an hour later, so we had to turn the motor back on. I think I need to add 'miles actually sailed without motor' to my monthly progress log! As I keep telling Dave, we'd actually sail more if we weren't trying to go everywhere and do everything. So picking up from yesterday's blog... the destination yesterday was Benao or Punta Guanico, about 10 miles apart just a little west of Punta Mala. Benao is open to the southwest, where both the wind and waves are coming from this time of year, so we weren't sure it would be a good anchorage. But friends had said you could tuck up way in and it's OK in mild weather. to go a little further so our next day wasn't so long. So we carried on to the Punta Guanico anchorage, about 10 miles further west. We stayed close in to sightsee along the coast. (watch out for fish buoys crossing the bay, but I think they are long lines, not nets). Approaching the spot where both guide books said there was an anchorage, it didn't look very calm. But we crept in closer and motored up and down the coast a little, and found a fairly nice spot that seemed tranquil. (07-19.709N 80-20.773W) Since the tidal range is 'only' 10 feet here, we anchored in about 15' deep at mid tide. The bottom was very good holding. We heard howler monkeys in the trees in the late afternoon. We could see the town further north in the bay, and hear music coming from a cantina (it was Saturday night), but weren't really interested in going in. A open fishing boat passed us in the early evening, going out to fish for the night. We saw 3 lights out near the point all night long, and they were still there when we left in the morning. I found out later that the long low island to the north of our anchorage (Isla Cana) is home to one of the most prolific nesting grounds for the Ridley sea turtle, and it is nesting season. It would have been nice to have explored a little, but we are running out of time, and didn't want to lose this weather window to finish the most difficult part of the passage. The next morning, we again got up at 5am and motored out and headed westward again. The Guanico anchorage had turned out to be very peaceful. But during dry season, with northerly winds, Benao might have been a better choice. On our passage from Guanico around Punta Mariato we experienced the worst of the current-against-wind conditions that people told us to expect along this coast. We had a 1-2 knot following (westbound current) and light westerly winds and a large SW swell. The current made the waves very steep and close together. We buried the bow several times, even though the wind was only blowing about 5 knots. The worst part was the last 10 miles approaching Punta Mariato. Then we carried on NW to Isla Cebaco, the SW corner, to an anchorage also called Ensenada Naranja (note that this Naranja ends in 'a' and the other one in 'o'). I did not number this one on our chartlet, but it is roughly due south of spot #5. We had some decent sailing winds the last 2 hours, but since we'd decided to push on all the way to Cebaco, we had to keep the motor on to keep the speed up, so we could make the anchorage before dark. It looked like, in the SW conditions, that the traditional anchorage in the SE corner of the bay would be totally exposed, so we needed time to try to find a good anchoring spot. We first went to the west side of the bay to look at what appeared to be on the chart, an anchorable spot with more protection. But it is not a designated anchoring spot in either guide book. And we agreed. It just looked too small to us, and maybe rocky on the bottom. Not near as anchorable as it appeared on the chart. It might be worth trying if you had more time to fool around. to Panama. Carina hadn't mentioned the moorings, though. But the fuel barge doesn't arrive until the winds change to a northerly quadrant, when the bay is well protected. Now, no barge, and all the moorings are empty--we were the only ones in the bay. We poked around and found a bit of room shoreward of the moorings. The bottom is good sand and the anchor hooked up smartly. The light SW wind, blowing right into the cove, at least held us into the swell (until it dropped and went NW after dark). Since the wind dropped, we have been drifting around all night in essentially no wind, sometimes beam-on to the swell. But after the 3rd day of 'up a dawn, going all day', we were pretty exhausted, and slept pretty well in spite of the roll. Our anchoring position is 07-29.528N 81-13.329W. Note that on our Raster chart, this point shows as slightly inland. This chart is an old one, with WGS-72 as the datum. There may be a newer version of this chart that plots correctly, but be cautious. Just before dark, a Canadian boat named Tao 8 sailed into the anchorage and dropped nearby. We chatted with Larry for awhile, swapping experiences in anchorages. They are on their way from Golfito to Panama City. We are currently under sail, having rounded the dreaded Punta Mala only a half mile offshore. Our departure from the Flamenco anchorage near Panama City 2 days ago was really hairy. In the morning the winds were light and it seemed time to go. But by the time we'd loaded the dinghy on deck and got ready, the winds had picked up again to about 15 knots right on our nose. Plus we had some current going against the wind, so the first hour was really unpleasant. At one point we were only making about 2.5 knots. I almost talked Dave into anchoring overnight at Taboga. But we pressed on another 15 miles to Punta Chame. #1 on the map below. By the time we arrived at Punta Chame at about 5pm, the wind and seas had calmed considerably, and our trip had not been unpleasant. We tried to pick an anchorage as far in as possible, but away from the very small town on the point. We came in at high tide on a 17' tide, and while Dave was fooling with the anchor, we edged in to water that was only 13' deep. At low tide we would have been high and dry there! Needless to say, we went back out to deeper water. We finally anchored at 08-38.794N 079-42.896W, in what would be about 15 feet of water at MLW. The anchorage was mostly tranquil in SW winds about 10 knots... at least until the current changed. With a 17' tidal range, the current rips in and out. In the middle of the night we were hanging dead stern to a 15 knot wind. Early in the morning, when the tide changed again, it got choppy enough to be banging us around. We finally gave up trying to sleep at about 4:45am and got underway. The day dawned bright and sunny, and the winds dropped to nothing. We motor sailed the whole way, mostly with some current behind us. 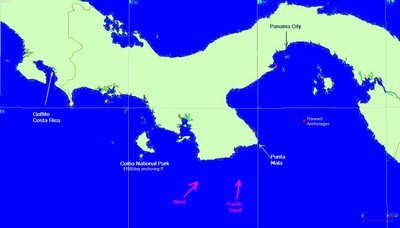 (there is a big eddy from the Humboldt Current that runs counter clockwise around the Bay of Panama). It was a beautiful day and we saw turtles, some very frisky small black spotted porpoises, whales, and jumping fish, as we sailed along. We anchored at Punta Purio at 07-39.312N and 80-03.759W, in about 12' MLW. By this time, amazingly, the wind was SE. We had seen this predicted on the GRIB files and thought it was bogus, but sure enough, we had SE wind until about midnight, when it turned W. Again we had a tranquilo anchorage until the turn of the tide near dawn. We are not sure what's up with that particular tide turn, but again it was choppy enough to wake us up early. We had nice winds when we woke up this morning... 5-10 knots from the NW. Leaving the anchorage, we angled out to get a look at Isla Iguana (another possible anchorage). There were an amazing number of frigate birds circling the island as we motored past. Probably a nesting ground. It didn't look like a very good anchorage. We put out the sails, and combined with the prodigious southbound current, we were clocking about 9-9.5 knots for awhile. We rounded Punta Mala about 9am with still light WNW winds and about 6" seas (with of course the ever-present large slow southerly swell underneath). Because the conditions are so tranquil, we stayed in close to sightsee. We were about a half mile offshore in 60' of water. There is something like a Coast Guard station at the point...a lighthouse and several fairly large buildings. Looks like the wind has laid down, so we plan to set out today for a 2 week cruise north and westward to Costa Rica. We hope to be in Costa Rica around Nov 1. Above, for your viewing pleasure, is a simple map of the area we will cover, and most of our planned anchorages. Click on the image if you want to see a larger copy. Sitting here waiting for weather, with the sewing machine newly tuned up, has been a great opportunity to work on sewing projects. The latest project is 'eyebrows' for the dodger. We have 2 big awnings that cover the whole boat. One goes from the mast to the forestay, and the other goes from the mast back to the arch in the back. However, we rarely put them up because (a) it's a big production to haul out and put up and (b) we never know when we'll get slammed with a thunderstorm and gusts to 40 knots. But having a little sun protection, especially just in front of the dodger and over the main cabin area, would be a good thing. So we sketched up a design for what Dave calls 'eyebrows'. A relatively short, flat sunbrella awning that we can leave up in fairly substantial winds. I made it in 2 pieces (one strip for either side of the mast). They fasten to the hard dodger top on the outboard side (just grommets and line), and fasten together under the boom at the back, and go forward to shrouds outboard of the mast. They turned out pretty good and we're congratulating ourselves on a good design... something that's easy to put up and leave up in most weather, and gives us some sun protection and some rain protetion. Yep, here we are again 'waiting for weather'. We finally got all our critical repairs done by last Saturday. Now we've been waiting out an unusual bout of high winds, I think caused by tropical activity in the Western Caribbean. Gosh I miss Chris Parker. However, I am finally accumulating enough weather links to feel like I have all the weather available to me as a layperson. And starting to feel like I know what is 'normal weather'. the advice is to go via the Las Perlas islands, to totally avoid rounding Punta Mala at all. But that doesn't make sense for us, because it would add about 90 miles to our windward journey. So if we get to one of our selected anchorages and it is totally untenable, we'll just have to gut it out, keep going, or go back. The good news is that it has been mostly sunny and cooler here the last few days. The winds have been really gusty in the 15-20 range. It's a nice change from hot, humid, rainy, and zero wind. It kinda feels like fall. We finally did resolve the issue with our 15 HP Tohatsu. After taking apart and cleaning the carbuerator 4 times over the last year, it did turn out to be the carb. We took the motor to the Tohatsu dealer here in Panama, and they did a full workover of the motor. They found a couple of minor things. But when they brought it back for a test drive, it still didn't work any better. The mechanic had insightfully brought a new carbuerator, just in case. When he swapped it out, the motor worked perfectly. They said that sometimes the carb just gets boogered up. So it cost us the price of a new carb, and some labor, but it's now performing properly. We have the old carb to keep as a spare. Dave wants to try to rehabilitate it some day when he has nothing better to do. Well, we're back here in Panama City. After about 3 days of enjoying the extra amps our new generator gives us, the battery charger in our Heart Freedom 20 Inverter/Charger went out. Dave spent a day in the Pedro Gonzales anchorage troubleshooting things. We borrowed another Honda genset from a friend and made sure it wasn't the generator. Then we called Xantrex (the new owners of Heart) and got some troubleshooting advice. When Dave exhausted everything we could think of, we headed back to Panama City to see if we could hook up with the Xantrex Authorized Dealer. Well, it turned out that the Xantrex rep is in David, the second largest city in Panama, and a 4 hour bus ride away. So we opted to instead take it to a local well-recommended electronics shop. (Electronica Ancon in Balboa, near the YMCA). They took it apart and did component level testing, and found a couple of relays that seemed to be burned. They replaced the relays and it seems to be working. Dave will install it this morning and check it out. Whew! I hope it works. Meanwhile, we've taken our sewing machine to the local Singer place. We're supposed to go back to pick it up today, with a handful of Sunbrella and the normal thread we use, so he an do a final tuning on it. I can't quite figure out what weather features are creating the big wind, other than maybe the 2 hurricanes off the coast of Central America, much further north than here. My grib files only go out 6 days, and I don't see any letup in the 20kt SW wind. Bleah!! The highs and lows move around but the wind doesn't seem to change. We haven't found a 'Chris Parker equivalent' over here in the Pacific, to help us learn how to read the weather patterns. There's a guy that forecasts further up north, but not really down here. We left Balboa on Saturday and have been hanging out at Isla Pedro Gonzales in the Las Perlas islands of Panama. When we got here on Saturday, in this normally quiet beautiful anchorage, we anchored in the middle of a 'weigh in' and sponsors party associated with a fishing tournament. We found 3 sailboats and literally 50 fishing yachts in the anchorage. There was a canopy with tables and chairs and a band on the beach. Lanchas were running back and forth carrying people into the party. They didn't invite us. The cruisers gathered on another cruising boat, RDreamz, to watch the fun. Fortunately Phil and Leslie on Carina had been thru one of these before, and said that most of the boats do not spend the night. True to form, all but about 6 boats left soon after dark. We've been doing 'boat projects' and socializing with the other cruising boats. A couple of boats have just arrived from western Panama (and before that, Costa Rica). So we've had a couple of happy hours, a trash burn on the beach, and a potluck on the beach. Dave got our dinghy wheels mounted. They are huge but effective. Thanks to Jim Yates for lugging them down in his luggage! You need them here because the 15-foot tide create very looooong beaches for dragging the dinghy up and down. We have commissioned our new Honda EU2000i generator. It is a quiet, light, but very effective gasoline generator. We were able to buy one here in Panama through Marine Warehouse for $1100 (you can buy them in the States for about $875 delivered). It is the size and weight of our sewing machine, so it is easy to move around, and store it down below when we're on the move. Dave made a plug that goes from the generator 110v outlet to our normal 30amp 110v shore power plug. Our Link 2000 has a way to limit the load that the battery charger draws (Power Sharing = 10amps) so we don't overload the generator. With this on, it starts out with a 60amp DC charge and then does the normal step down as the batteries come up. Though Dave is an avowed solar power nut, we have found that trying to live on 100% solar power during rainy season near the equator isn't cutting it. We have 2-3 day stretches where we aren't getting enough sun to keep up. So we will use the generator to fill in the gaps and save wear on the engine. So far we're really liking it. Our Outback solar controller showing 30amps going into the battery, late morning on a sunny day. We ran a new halyard for our Code Zero sail yesterday, and Dave wanted to route it inside the mast on the way down. So he spent yesterday cutting a hole in the mast to let it out. We've spent some time swapping cruising info with the boats headed into the Caribbean, and info on Panama and Golfito, Coasta Rica for us. Both Carina and RDreamz are headed into the Pacific this season, so we've also spent some time swapping info with them. I have also been working on understanding the Pacific weather products, so we can figure out weather windows. Unfortunately, it sounds like getting to Costa Rica from here is going to be another nearly upwind and maybe upcurrent slog for 400 miles. Fortunately it's light air season, and we don't have to do it all in one jump.